Jack O’Connell might have the coolest job in the world. As secretary/treasurer of the Baseball Writers’ Association of America, I’m sure he’s got to do some boring clerical stuff. But once a year, he gets to call up the greatest baseball players who ever lived. And he’s always the bearer of good news. Maybe not a ton of drama there (Griffey has been bound for Cooperstown since Bill Clinton was still in office), but that’s a great thing to watch. I’m absorbed trying to read his facial expression when he’s told he received the highest vote percentage ever. Is he thrilled to have broken the record? Or is he slightly disappointed he was somehow left off three ballots? Here’s (part of) Piazza’s phone call. Either someone forgot to start rolling, or (hopefully) he swore so much they had to cut it out. So, onto the important business: caps! While the final decision on which team cap is depicted on players’ plaques belongs to the Hall, players get a say. And in his 2013 autobiography, Mike Piazza firmly declared he’d want to go in as a Met, or with a blank cap. Much of that was his lingering frustration with perceived low-ball offers from the Dodgers during his career, but a Mets cap makes more sense. 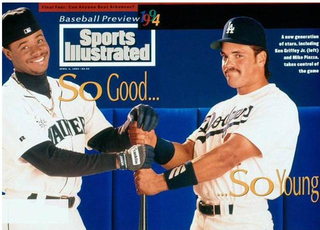 Griffey, of course, will go in with a White Sox Mariners cap. But which way will it face? Griffey’s backwards cap became his trademark—which is satisfying, given how many cranky sportswriters at the time derided it as everything wrong with kids those days. Could Griffey possibly wear a backwards cap on his plaque?